Leverage Ingenico unattended solutions to easily integrate cashless payment in your self-service business. Accept all payment means and comply with the latest standards. Cut complexity in payment and security. Address all self-service market segments: Retail, Hospitality, Petrol, Vending and Transportation. The iSelf-Series meet the latest hardware and software mandatory requirements. PCI-PTS 3.x. certified, both iUP250 and iUR250 (part of the iSelf series) meet the highest and latest hardware and software mandatory security requirements. The iUP250 also complies with open protocol and SRED modules. The iUP250 + iUR250 enables EMV Chip and PIN, MagStripe transactions on kiosks while respecting security standards and improving customer interactivity. Transactions are simpler, faster and more secure. The iUC150 offers contactless payment, enabling e-wallet and new payment use cases. It also complies with standards such as MasterCard PayPass™, Visa PayWave™ and EMV contactless cards. Thanks to its robust design the iSelf series stands up to the most demanding outdoor environments and a wide variety of adverse environmental conditions. Keypad, card-reader and contactless device components are proofed against vandalism (IK10) and extreme weather. Powered by Ingenico,Telium2 Technology is the result of 30 years’ experience in the payment industry. Secure, highly integrated and fast, Telium is the world’s best platform to provide payment services. It provides a fully scalable, reliable operating system embedded into the 20 million terminals deployed worldwide. 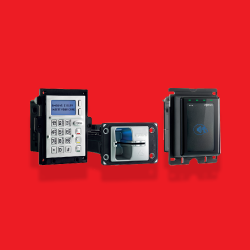 Our compact and modular iSelf series devices are embedded in their enclosure and integrated according to EVA* / IMB** market standards. Maintenance requires no additional equipment and updating is done simply with the iUP250 display and keypad. It is so fl exible that interfacing with the entire kiosk system has never been so easy. The iSelf series provides a simple and easy-to-use customer interface with brightly colored backlit displays, LEDs and function keys, making their use a pleasureful experience. Transflective technology enables the iSelf series to work in any lighting condition. The iSelf series provides a wide range of integrated connectivity features to communicate with kiosks and acquirer hosts. It includes USB (slave, master), RS232, MDB (slave, optional master), Ethernet and optional GPRS, covering most kiosk system requirements. Stand-by mode guarantees optimal energy efficiency. Ingenico is a reference in safeguarding the environment. Our manufacturing facilities are ISO 14001 certified.